The original idea was that the movie should be released before the television series, so that the movie would promote the series thus gaining viewers. As you all know, this did not happen. Purely because ABC’s viewing figures in 1965 were terrible and they were desperate for something fresh and successful fast, which put the film onto the backburner. 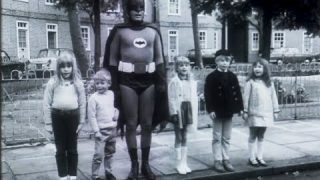 After the huge success of Batman’s first season production of the movie was pushed back up high on the agenda. Now the movie intended to gain overseas viewers to promote the TV series, as other than the United States the movie was shown before the TV series. Also the large movie budget allowed the production of new Bat-Vehicles: the Bat-Boat and Bat-Copter. 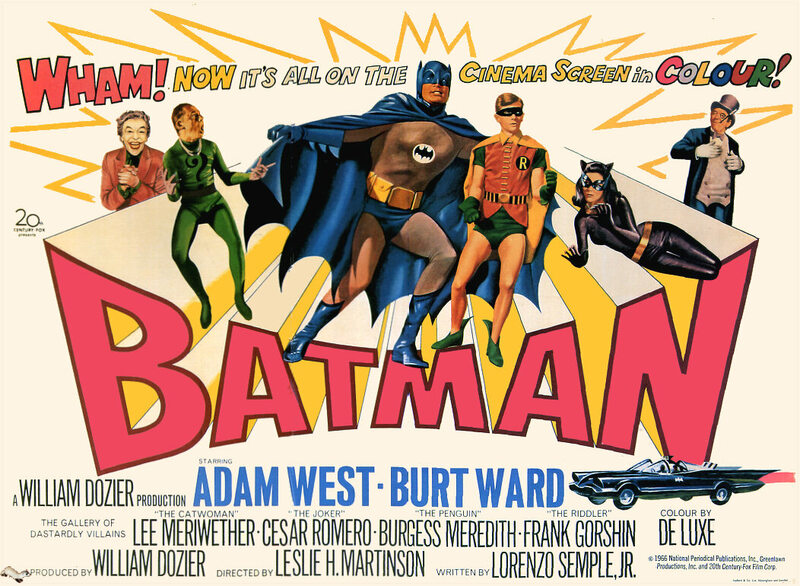 The Movie had an even great success in the UK as Batfans got to see Batman in colour for the first time, this was because colour televisions weren’t introduced in the UK until 1969. 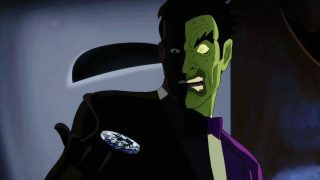 The only specifications Fox demanded from William Dozier were to use all four major villains and to have Lorenzo Semple Jr. (who wrote the majority of first season episodes) to write the script/story for the Movie. 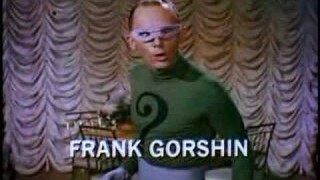 This in itself has made a huge impact on the whole Batman history as before 1966 Batman the Riddler was not regarded as a “major” villain, appearing only a handful of times within the comic books. Also the Catwoman had been missing from the comics for several years as it was felt unacceptable to show women with “over-exaggerated” features appearing in roles such as criminals in American media. DC Comics actually had idea’s to turn Catwoman into a hero because of this. However, thankfully the 1966 Movie and series combined allowed for the return of Catwoman. 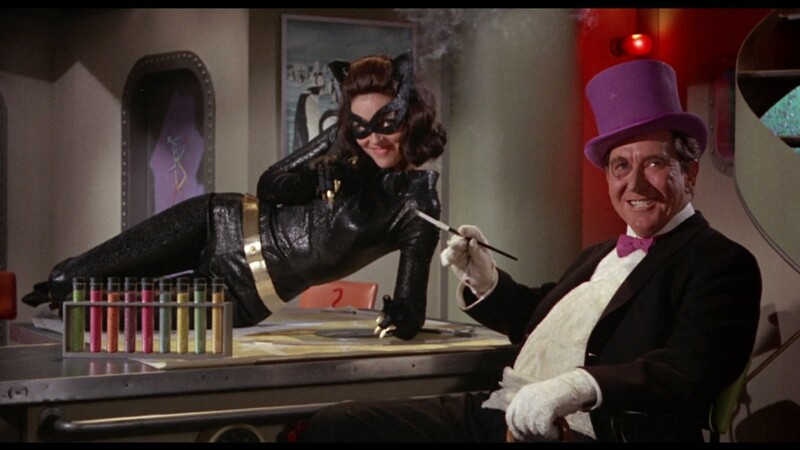 Since the 1966 Movie both Catwoman and Riddler have appeared in the comics numerous times as well as the Batman Animated Series and the latest movies. 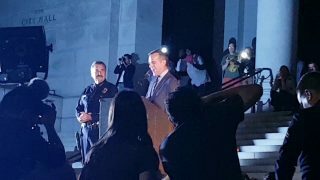 The estimated cost of the Movie is $1,400,000. Considering Fox was low on money during this period, the budget was very generous showing that they had a lot of faith for Batman. It was filmed with a 26 day shooting schedule. If you notice a lot of the storyline revolves around the Penguin, it’s his submarine, his dockyard hideout, his henchmen. The Penguin was the sort of leader within the gang of four criminals, which isn’t surprising as Burgess Meredith’s Penguin was the favourite guest villain amongst the script writers.